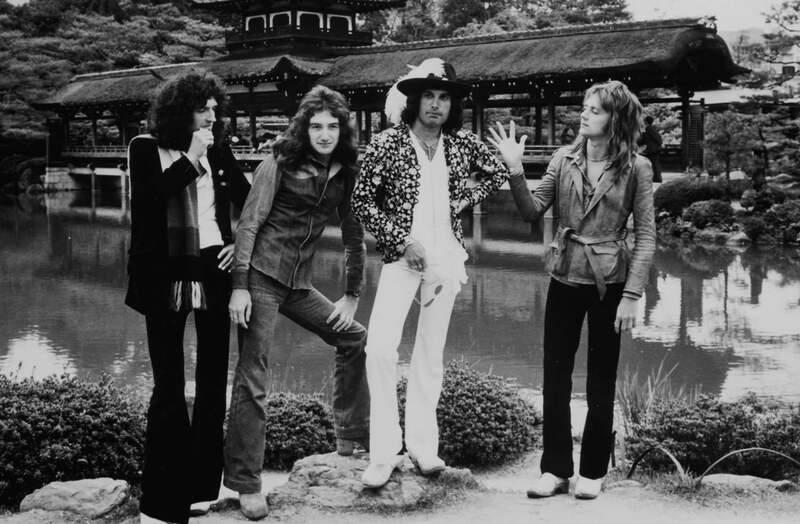 Queen formed in 1971 and in 1973 signed their first recording contract for EMI. That year they released their first album, Queen. The same year saw their first major UK tour, and in 1974 they released Queen II as well as making their first UK headlining tour. They made their first US tour, and in November released Sheer Heart Attack which was a hit on both sides of the Atlantic. 1975 saw their new release, A Night At The Opera, and – significantly – the single Bohemian Rhapsody. At 5’ 55” it should have been too long for successful radio play but it became one of the greatest singles of all time, staying at No. 1 in the UK chart for nine weeks. The video, directed by Bruce Gowers, is credited with being the first genuine promotional video. The song has regularly featured in all major pop polls and was recently named again as the best single of all time. The success of A Night At The Opera was equally stunning, giving the band their first platinum album. In 1976 they toured the US and Japan and by spring all four albums resided in the UK Top Twenty. Later that year they released A Day At The Races, and gave a free concert in Hyde Park to an estimated crowd of 200,000 fans. The album was a huge success, advance orders alone amounting to over 500,000. The following year saw two major US tours, the band’s sixth album, News Of The World and the legendary double A side single, We Will Rock You and We Are The Champions. 1978’s Jazz, included another huge hit single in Bicycle Race and Queen toured the US and Canada. They spent much of 1979 touring in Europe and Japan, as well as releasing their first live album, Live Killers. They were also approached to write the score for a forthcoming feature film, Flash Gordon. Before that they released The Game in 1980 which went five times platinum in Canada alone! Another One Bites The Dust became the band’s biggest selling American single. Later that year the soundtrack for Flash Gordon was released and by the end of the year Queen had sold over 45,000,000 albums worldwide. In 1981 they toured the Far East and were the first band to make a stadium tour of South America. They played to 131,000 people in Sao Paolo, the largest paying audience for any band anywhere in the world. Greatest Hits, Greatest Flix and Greatest Pix were released simultaneously later in the year and Greatest Hits has rarely been out of the UK album charts since. Greatest Flix was the first collection of promo-videos released commercially by any band. Next year saw the release of the band’s twelfth album, Hot Space whilst they were in the middle of a European tour. 1984 saw The Works and the single Radio Ga Ga became a worldwide hit, reaching No. 1 in 19 countries. Another huge hit was I Want To Break Free, featuring one of their most famous videos, all dressed in drag. In 1985 they were the headlining act at Rock in Rio, the biggest festival to be held anywhere in the world. They again made history that year with the show-stealing performance at Live Aid from Wembley Stadium, which proved to be a turning point for the band, One Vision being the first post Live Aid release. 1986 saw their 14th album, A Kind Of Magic, which was the soundtrack to the Russel Mulcahy film, Highlander. The title track became another worldwide smash and the album entered the UK charts at No. 1; later in the year the 2nd live album, Live Magic, went into the charts at No. 3. Between 1988 and 1991 Queen released three more albums, The Miracle in 1989 and in 1991 Innuendo and Greatest Hits II. All three entered the UK charts at No. 1, as did the single Innuendo. On 23rd November 1991 Freddie Mercury announced to the world that he had AIDS and the next day he died peacefully at his home, surrounded by family and friends. He remains the most high profile loss from the disease in the entertainment world and the news shocked fans throughout the world. As a tribute Bohemian Rhapsody / These Are The Days Of Our Lives was released as a double A-sided single to raise funds for the Terence Higgins Trust. It entered the UK chart at No. 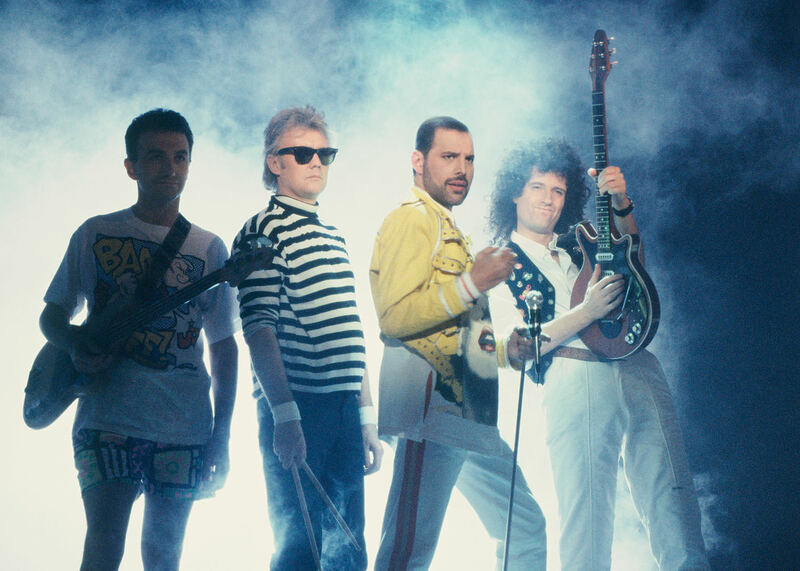 1, where it stayed for five weeks, raising over £1,000,000 for the charity and Queen became the first band to have the same single top the UK charts twice. In December of that year Queen had 10 albums in the UK Top 100. In 1992 Freddie was awarded posthumously the BRIT’s “Outstanding Contribution to British Music” and Days Of Our Lives won Best Single. On 20th April many of the world’s top stars joined Brian, Roger and John on stage at Wembley for an emotional tribute to Freddie. In 1995 the tracks that Queen had begun in 1991 were completed by Brian, Roger and John and the long-awaited Made In Heaven was released worldwide. It was the end of an era. Since then the phenomenon of Queen has remained, however, with continuing sales for their recorded output on CD and video. A ballet of their music by famous French choreographer Maurice Bejart was premiered at the National Theatre in Paris in 1997 and in May 2002 the hit musical We Will Rock You opened to sell-out audiences in London’s West End and continues to play to packed houses and standing ovations every night. Queen’s first DVD Greatest Video Hits Vol.1 was released at the end of October 2002, and yet another piece of Queen product entered the UK charts at number 1. October 2002 also saw Queen receive their own star on the Hollywood Walk of Fame, Los Angeles, joining The Beatles as only one of a handful of non-US bands to receive the much coveted honour. Last year, 2004 they were inducted into the Rock and Roll Walk of Fame, and in the UK were voted by the public into the first UK Music Hall of Fame. Queen’s musical has since opened in Australia, Spain, Las Vegas,USA, Russia, Germany and Japan and continues to have touring productions across the world. Brian and Roger continue to be ambassadors for the Mercury Phoenix Trust, the HIV/AIDS charity set up following the death of Freddie in 1991. To date the charity has helped over 800 projects worldwide and raised over $16 million in the fight against the disease. Brian and Roger took Queen back onto the touring circuit for the first time since 1986 in 2005 and 2008, joined by former Free/Bad Company singer, songwriter and musicial Paul Rodgers playing concerts across the UK and throughout Europe. Since 2012 Queen have enjoyed a fruitful collaboration with US singer/songwriter Adam Lambert and have toured extensively across North and South America, Europe, the UK, Asia and Australia and New Zealand.